1. Put all the ingredients in a large bowl, season and toss gently to mix. Thread onto 8 large metal (or well-soaked wooden) skewers, alternating the ingredients. 2. Griddle or barbecue the kebabs for 1-2 minutes on each side (6-8 minutes in total), turning until well caramelised. 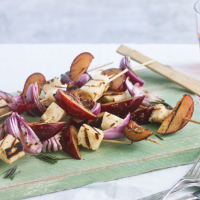 Serve with salads as part of a barbecue.